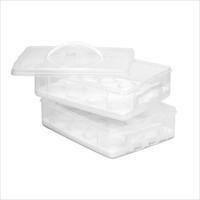 (1 ea) 4.5-Cup, 2-Cup, 1.25-Cup Canisters, lids. 22.8-Cup Jumbo Cereal FlipTop, lid. 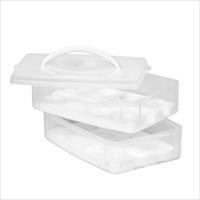 Snap lock lid with silicone seal opens and shuts easily . 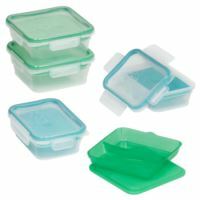 Refrigerator and freezer safe, BPA Free. Hand wash only, Made in the USA, Lifetime Warranty. Includes 2 removable Egg Holders . Microwave, dishwasher and freezer safe . BPA free polypropylene container and lid . 10" x 6.5" x 5.25 . Made in the USA, Lifetime warranty. 14.3" x 10.5" x 3.75"; 2 Layers; Stored serving knife . Snap lock lid with silicone seal opens and shuts easily . 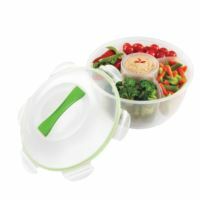 Microwave, dishwasher and freezer safe, BPA free. Made in the USA, Lifetime Warranty. 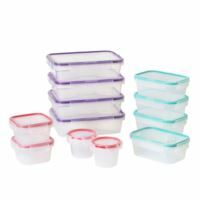 Set includes: 4 each: 2 cup rectangle with teal seal, 4.5 cup rectangle with purple seal; 2-each: 1.3 cup square with red seals and .5 cup mini rounds with red seal. Snap lock lid with silicone seal opens and shuts easily. Microwave, refrigerator and freezer safe. Dishwasher safe, top rack only. BPA free polypropylene container and lid. Made in the USA. Limited Lifetime Warranty. (2ea) 4-Cup squares, (1ea) 1-Cup round and 4-Cup rounds. 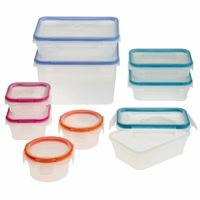 Each with four tablocking lids. All natural, stain-proof, shatter-resistant glass vessels. Tempered glass container is oven safe. 100% airtight and leak-proof lid. Microwave, dishwasher and oven safe. BPA Free. (2ea) 1-Cup and 4-Cup squares, (1ea) 6-Cup rectangle. Each with four tablocking lids. All natural, stain-proof, shatter-resistant glass vessels. Tempered glass container is oven safe. 100% airtight and leak-proof lid. Microwave, dishwasher and oven safe. BPA Free. (3) 3-Cup Rectangle, (2) 1.2-Cup Round, 1.34-Cup Square. (1) Each: 8.2-Cup Rectangle, 16-CupTall Rectangle. All with Latch Locking Lids. Multiple sizes and shapes for maximized versatility. 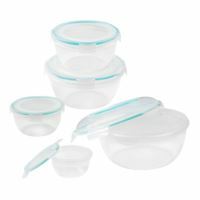 Easy-to-open, four-latch, air-tight and leak-proof lids. (2) 3-Cup Rectangle, (1) Each: 1.2-Cup Round. 1.3-Cup Square, 8.2-Cup Rectangle. All with Latch Locking Lids. Multiple sizes and shapes for maximized versatility. 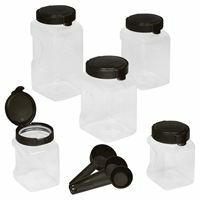 Easy-to-open, four-latch, air-tight and leak-proof lids. 4-pc Colander / Bowl set includes one each: 25.3-cup bowl with matching spill proof cover, removable colander and covered dip container. Snap lock 6-latch lid with easy to carry handle opens & shuts easily . Microwave, dishwasher and freezer safe and dishwasher-top rack only . BPA free polypropylene container and lid. Four-compartment colander/divider with covered dip container . Large salad bowl can be used with or without the divider. Room for ice: Place ice inside of the bowl to keep food fresh and crisp at parties . 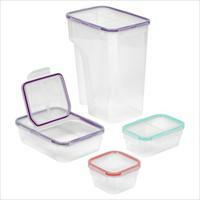 Set includes: 1.16 cup; 2.62-cup; 6.51-cup; 10.7-cup and 16.9-cup with matching spill proof lids. Snap lock lid with silicone seal opens and shuts easily. 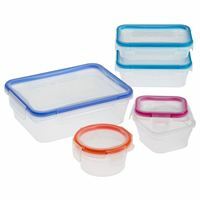 Microwave, refrigerator and freezer safe. Dishwasher safe, top rack only. BPA free polypropylene container and lid. Limited Lifetime Warranty. (1) 15.9-Cup, (2) 11.1-Cup, (2) 4.4-Cup Canisters, lids. 1/4-Cup, 1/3-Cup and 1/2-Cup Measuring Spoons. Snap lock lid with silicone seal opens and shuts easily . 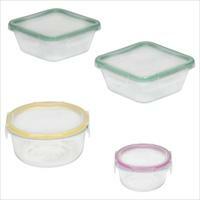 Refrigerator and freezer safe, BPA Free. Hand wash only, Made in the USA, Lifetime Warranty. 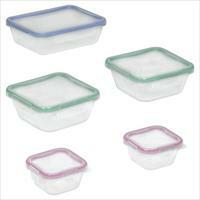 Set Includes: Two each 3-cup rectangular containers with lids, 5.4-cup square containers with lids, Dividers. Four Ice Packs. Dividers separate contents. Airtight, leakproof latching lids. Customizable lid lets you label containers. Ice pack keeps food cold for extended periods of time.